Photovoltaics system can be bulit in Czech Republic pursuant to Act No. 180/2005 Coll. on the promotion of electricity from renewable sources. Unfortunately, it turned out that the state system in the Czech Republic is nothing sacred - not even the law. MPs modified the original law in these novels retrospectively, ie with certain provisions retroactively and thereby damaged the majority of investors.Since the beginning of 2014 is the construction of photovoltaic systems provided no subsidies or preferential purchase price for electricity. Power plant put into operation after March 1, 2011 are eligible for a green bonus / direct repurchase only in the case of installing on roofs or facades of a building attached to the ground solid foundation, which is registered in the Land Registry. The installed capacity of production shall not exceed 30 kW. There is introduced so-called withholding tax of 26% (direct repurchase) and 28% (green bonuses) for electricity produced from solar radiation in plants put into operation in the period from January 1, 2009 to December 31, 2010. This levy has to pay for a period of 3 years with effect from January 1, 2011. From payment are exempt factory with an installed capacity of 30 kW, which are fitted to the roof structure or external wall of a building attached to the ground solid foundation registered in the Land Registry. Since 2014, manufacturers of photovoltaic power plants larger than 30 kWp is dividend withholding tax of 10% over the lifetime power plant. For photovoltaic installations for houses, apartment buildings, prefabricated buildings, etc. apply § 48 of the amended Law on Value Added Tax. There is reduced VAT rate of 15%, for the construction work and technical means of photovoltaic power plants. For solar power plant installed on the roof of the building is going to be technical evaluation in terms of tax deprecation and also to the creation of a separate movable assets - the solar system producing alternating or direct current. The system in the past fell into the third category of depreciation with depreciation period of 10 years. The amendment of the Income Tax Act has brought new measures also in the area of ? ?tax depreciation. If there are parts of solar power plant which are depreciated in second and third depreciation group, they have have extended depreciation without exception for 20 years. This solar power plants must be marked by the Standard Classification of production code 31.10, 31.20 and 32.10. For all operators solar power plant are introduced mandatory uniform depreciation without the possibility of interruption. Since January 1, 2011 are canceled the 5-year tax holiday on income from pphotovoltaics system FVS, even for installations that have been implemented and connected to the grid before that date. This tax exemption provides for an amendment to Act No. 346/2010 Coll. the Income Tax Act in November 2010. 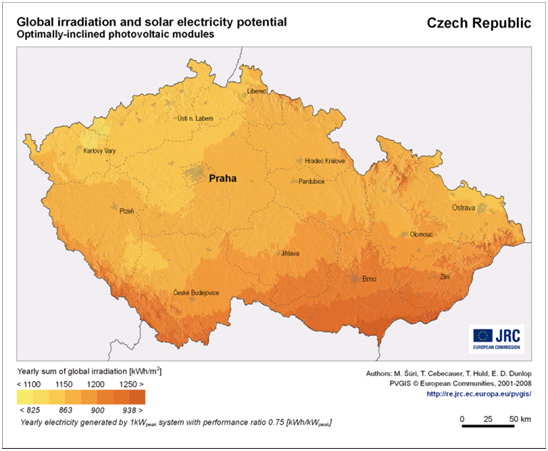 Czech Republic does not have very good location but offers good conditions for sun light and is good for construction of photovoltaic power plants. The minimum luminance in the Czech Republic ranges from 950 kWh/m2 and maximum is around 1150 kWh/m2. See below attached map exposure under ideal conditions.